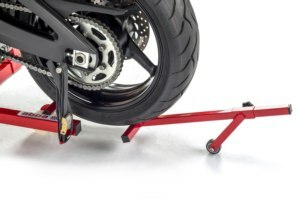 This unique product will enable you to remove and fit a motorcycle wheel safely and single handedly on your own. 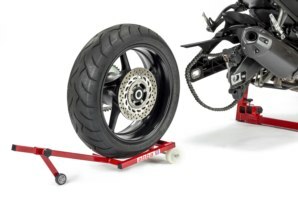 Ever tried re fitting a motorcycle wheel? It can often be a seemingly impossible task having to hold the wheel at the same time as "trying" to locate the disc in the caliper, hold wheel spacers in position, aligning the chain and inserting the wheel spindle all at the same time! The unique abba wheel rizer will support the weight of your wheel at the correct height enabling your to have both hands free to make any alignment adjustments before easily inserting the wheel spindle. 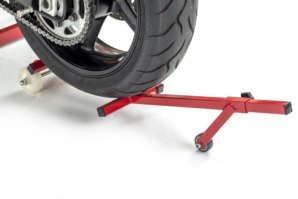 Using this product is a simple case of sliding the wheel Rizer into position, lower the jockey wheel down so the wheel rizer arms support the motorcycle wheel. Remove your wheel spindle and slide the wheel out of the bike on the Rizer. Upon re-fitting just drop the wheel back on the Rizer and slide the wheel back into the bike. 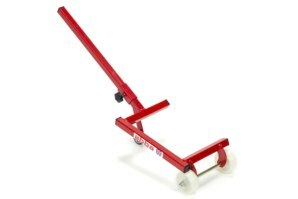 The Rizer will hold the wheel in the correct position taking the back ache and inconvenience of having to hold the wheel off the ground, giving you TWO hands free to locate the chain, wheel spacers and inserting the wheel spindle. 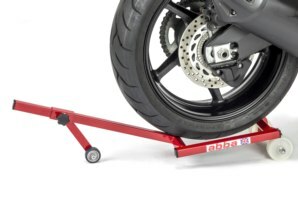 As with any wheel removal job it is advised the bike is supported with the abba Superbike stand as this fits to the centre of the bike and will not restrict access when removing the wheel or using the wheel Rizer. 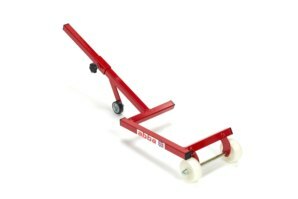 Makes wheel fitment and removal considerably easier. Takes the back ache out of supporting the wheel weight with your hands. 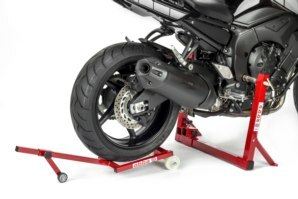 Fully adjustable jockey wheel enables you to support the wheel at any height required. Can be used on front and rear wheels. Can be used with the abba Front Lift arm in place, so both wheel can be removed at the same time. 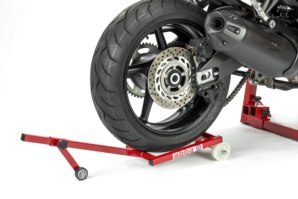 Can the Wheel Rizer be used when my bike is on a conventional rear paddock stand? 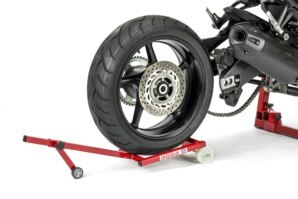 The wheel rizer is designed to be used in conjunction with the abba superbike stand, however it is possible in most cases that it can be used with a paddock stand. As the design of paddock stands can vary it could be a little more difficult to locate on some versions. 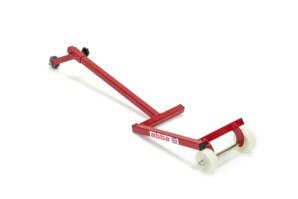 Got a Question about the abba Wheel Rizer? If you would like to ask us a question about the abba Wheel Rizer, simply fill in the form below and we will contact you within two working days. Want to tell a friend about the abba Wheel Rizer? Alternatively fill in the form below and we will send an email on your behalf to your friend, with a link to this page all about the abba Wheel Rizer.